Below is a selection of vignettes from the lives of the Irish saints referring to the Lenten fast. In some cases the hagiographers invite us to admire the ascetic prowess of the saints but in others they offer a lesson in the true meaning of fasting. One of his disciples was requested by the son of Oswald to choose a site on which to erect a monastery. Yielding to his desires he searched out a solitary spot amid the wild and barren hills, which seemed, says Bede " better suited as lurking places for robbers, and retreats for wild beasts, than as habitations for men," and he requested the royal permission to purify the place from the contagion of its former crimes, by prayer and fasting, which was "the custom of those from whom he had learned the rule of regular discipline." He accordingly proceeded thither to spend the whole time of Lent, fasting every day except Sunday, with no other sustenance than a very little bread, one egg, and a little milk mixed with water. When there were ten days of Lent still remaining there came a messenger to summon him to the king, and he, that the religious rite might not be intermitted on account of the king' s affairs, requested another priest to complete the fast which had been so piously begun; and, as Bede adds, the time of prayer and fasting being ended, he built there a monastery, which is now called Lastingham, and he established there the religious rule according to the model of Lindisfarne. It happened, that a scarcity of corn prevailed in the Liffey's plains, on a certain occasion, and St. Brigid was requested by her nuns to visit St. Ibar —a bishop who then dwelt in the plain of Gesille —to ask him for corn. Our Saint assented, and on her arrival, she was joyfully received by this holy bishop. However, when Brigid and her companions came, he had nothing for their entertainment, but stale bread and some bacon. Although this visit took place in Lent, both saints partook of such fare; but, two of the nuns, who accompanied our Saint, refused to eat portions of bacon set before them. A miraculous occurrence, however, reproved their recusancy. 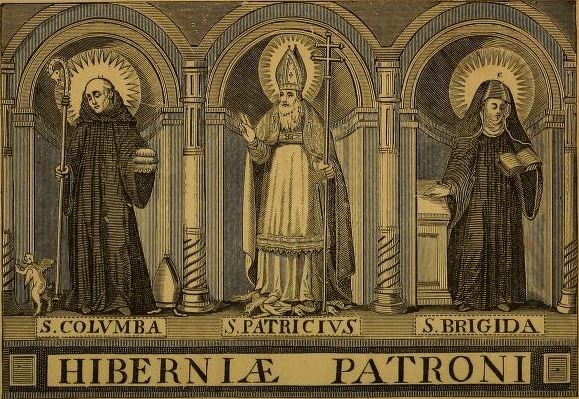 St. Brigid heard of it, and she greatly blamed her nuns in St. Ibar's presence. She ordered them, at the same time, to go out of doors, and to commence a penitential fast. Then said Brigid: "Let us fast with them, and pray to God." The Almighty heard their prayers, and soon afterwards a second miracle was wrought. Bread was set before them, and when blest, it was partaken of by the saints. Bishop Ibar asked Brigid the cause for this her Lenten visit. Then she told him her desire to obtain a supply of corn. The bishop smiling said: "O Brigid, if you had seen and known the quantity of corn in our possession, you should find, that the amount of our gift to you must be small." The virgin replied, "This is not the case, at present, for you have twenty-four waggon-loads of grain in your barn." Although the bishop had only a very small quantity at first, yet on enquiry, he found the prediction of the holy abbess verified. He gave thanks to God, and then he divided the heaps. Ibar retained twelve waggon-loads for his own use, reserving the remaining twelve for Brigid and her sisterhood. The favourite retreat of St. Canice was a solitary spot in a marshy bog called Lough-cree, situated between Roscrea and Borris-in-Ossory. There the saint erected a cell, and thither he loved to retire, in order to enjoy the sweets of silent meditation in the study of Sacred Scriptures. It became, in later times, a favourite resort for pilgrims, and it was popularly known as Monahincha, or "Insula Viventium." On this island Canice more than once passed the whole time of Lent, keeping a rigorous fast for forty days. (8) Now St. Ciaran of Clonmacnois was at that time in the power of King Forfige (Furbaide) on account of a cauldron belonging to the king which Ciaran had given to God's poor. And the king said to Ciaran: “If thou wouldst be set free, seek for seven sleek red calves with white heads”. Afterwards Ciaran of Clonmacnois came to Saighir where Ciaran of Saighir was, to ask him whether he could find the like of this ransom which was demanded of him, namely seven sleek red calves with white heads. And when Ciaran of Clonmacnois reached Saighir, he found there in the guest house the two Brendans, namely Brendan of Birr, and Brendan son of Findlugh. Ciaran of Saighir was delighted to see this company, and said to his cook : “What hast thou that we can set before these guests?” “There is a gammon of bacon”, said the cook, “but I bethink me that it is a fast”. “Set it before the guests, nevertheless”, said Ciaran ; and it was taken to them; and it was found to be fish, and honey, and oil, through the word of Ciaran. And the name of God and of Ciaran was magnified thereby. But there was a lay-brother there, the son of the cook, and he would not sup with them, because he had seen the gammon of bacon in the cook's hands, and he did not wish (to eat) meat on a fast day. Ciaran of Saighir said to him: “Thou shalt eat beef red-raw in Lent, and that very hour thou shalt be slain by thine enemies, and shalt not receive the kingdom of heaven.” And this was fulfilled, as Ciaran said. Some travellers came to S. Cronan, and he at once produced all he had for their refreshment, and sat down with them. "Humph!" said a stickler for rule, "At this rate, I do not see much chance of Mattins being said." "My friend," said Cronan, "in showing hospitality to strangers we minister to Christ. Do not trouble about the Mattins, the angels will sing them for us." In the ancient Tripartite Life of St. Patrick, attributed to St. Evin, it is also said that Fiecc went on every Shrove-Saturday to a cave on the hill of Dromm Coblai. He used to bring with him five loaves of bread; these sufficed for his food during the whole time of Lent, which was passed in the cave in silent prayer, and on Easter Sunday he returned to Sletty to celebrate with his brethren the joyous festival of Easter. During the time of Lent, when our saint lived in the desert, an Angel of the Lord appeared to him, on three different nights. This Angel said : " O servant of Christ, that rock hanging over the cave in which you dwell, will soon fall upon it, wherefore speedily look out for some other place." St. Kevin replied : " This is a narrow place in which I dwell, but, I wish to remain in it, during the time of Lent, if it be pleasing to God." The Angel continued : "Truly, the hand of the All-powerful God shall sustain this rock for many days, lest it should deprive thee of life." Saying these words, the Angel vanished. Holy Kevin then said within himself: "Trusting in the Lord Jesus Christ, my God, here shall I remain, until Eastertide." When the holy evening of Easter came, the Angel again warned St. Kevin: "Depart immediately from this cave following me." Then, blessed Kevin followed the Angel across the Lake and with dry feet. As the Angel had intimated, the rock fell immediately afterwards on the cave, so soon as our saint had taken his departure. (118) On another occasion, after the example of Moses the son of Amra and Elijah the Prophet and Patrick the son of Calpurn, and further, after the example of the King of heaven and holy earth, Jesus Christ, Maedoc was in fasting and abstinence for the forty days and nights of Lent in his own monastery, Ferns, without tasting earthly food or drink all that time. And after that fast and abstinence it seemed to his family and to everyone else that he was stouter and stronger and better in form and feature than ever before. 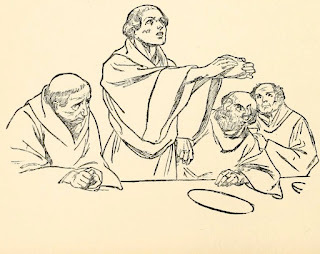 Maeldithruib lived on bread and water every Lent for the good of his father's soul, usque ad novissimum tempus: for his prayers were always occupied therewith in Lent. Now Molasius the miraculous with his monks was for the forty days of Lent without consuming bite or sup, or any meat in the world but fruits of trees and earth’s plants and herbs; while yet another Lent he with his monks was for forty days without any kind of meat whatsoever, saving the cellarer’s hand full of barley grain to each monk from the one midday to the other. xv. 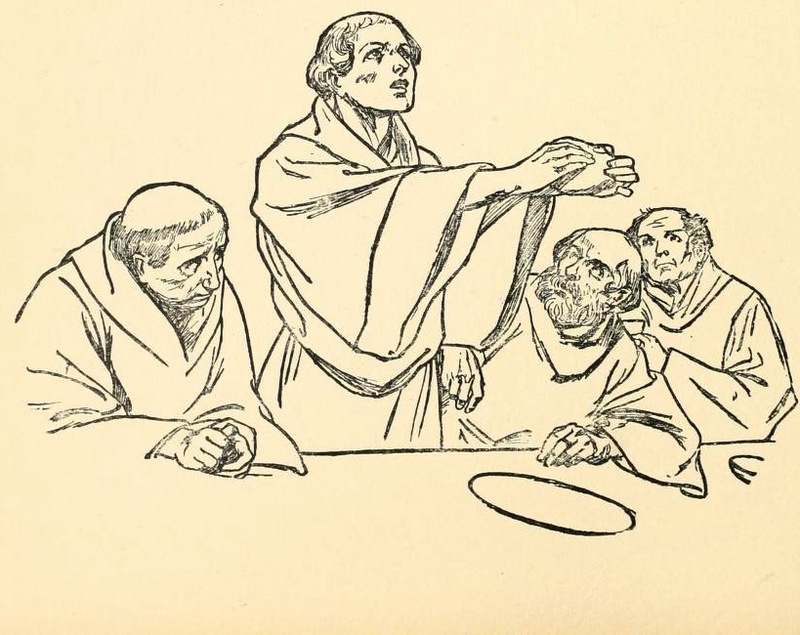 (45) Once during Lent Ruadan stood and said to his monks : “There is a company of saints coming to visit you; set meat before them, and eat of the meat yourselves when it happens that you cannot provide enough for them of other food.” When the saints had arrived, the monks brought the meat. Ruadan sained the meat, though he was abashed before them. The Lord Jesus Christ turned the meat into bread in honour of Ruadan. (46) When, however, the saints set themselves at table, a novice who had come with them to the place, refused to eat the bread, through doubt and in devotion, because he had seen that the bread had been made out of meat only a little while before. A sufficiency of other bread was found for him. And while the novice was eating the bread, it appeared to the clerks, and to all besides, that bright red blood was dripping from his lips, and that it was flesh that he was eating. It was evident to him that every one was gazing at him thus. The novice repented earnestly of what he had done. When Ruadan saw the repentance of the novice, he sained his portion ; and the Lord turned it into natural bread in honour of Ruadan afterwards.